Toyota Yaris Performance, Engine, Ride, Handling | What Car? The entry-level 1.0-litre three-cylinder petrol model is very slow, even when you work it hard, and struggles to keep up with traffic on faster roads and across hilly terrain. It doesn’t cost much to upgrade to our favourite engine, the four-cylinder 1.5, which is more flexible, has better throttle response and a decent turn of pace when you rev it harder. The hybrid model, which combines a 1.5-litre petrol engine with an electric motor, is perkier still, albeit hardly brisk. But while it needs working hard on the motorway, it’s peppy enough around town and you’ll find it running in electric mode much of the time in stop-start traffic assuming you’ve a light right foot. Whichever version you pick, none has the same zingy power delivery as the latest small turbo petrol engines from Volkswagen, Seat and Ford. To make up for the hybrid's extra weight, Toyota has stiffened the model’s suspension over the others. 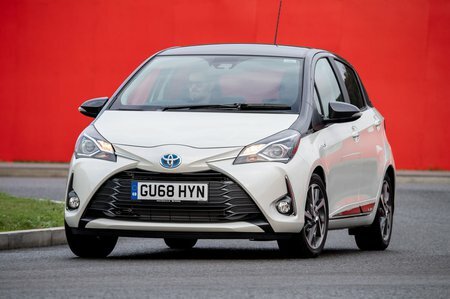 That sounds like it should be bad news for ride comfort but, in fact, thanks to further revisions this model has received to its suspension, it is the most comfortable version of the Yaris. 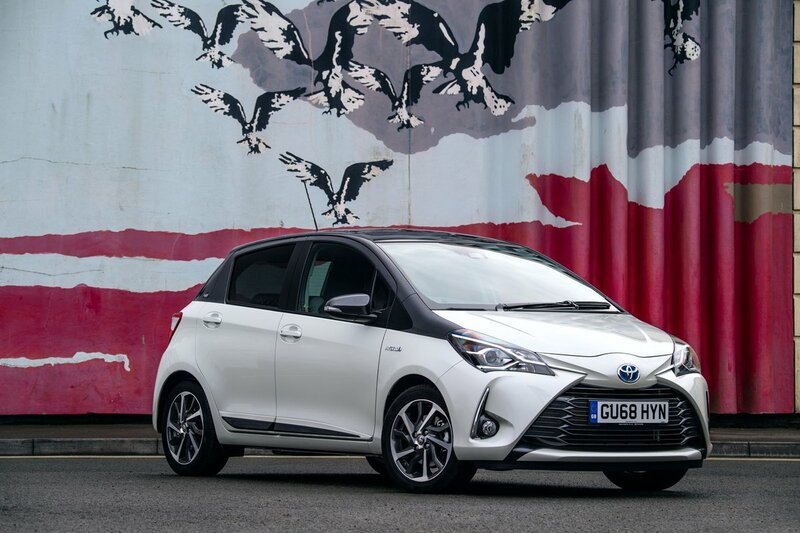 The Yaris Hybrid soaks up bumps well while controlling its body movements better than the floatier 1.0 and 1.5 versions. If you want to maximise comfort, we’d stick to 15in wheels as the 16in items aren’t as good as isolating you from patchy urban roads. The GR Sport gets even bigger 17in wheels plus sports suspension so it really thuds over potholes. When it comes to driver appeal, any small car faces judgement against the Seat Ibiza, which is one of the sweetest-handling hatchbacks available. All its rivals struggle to match it. The Yaris is no exception. Toyota has stiffened up the bodyshell to help the car feel more planted in corners, but the light steering gives the driver little indication of what the front wheels are up to. It also feels less eager to turn in to corners than the Ford Fiesta or Ibiza, rolls over more in bends and runs out of grip more quickly. Hybrid versions come with skinny eco-tyres as standard, Because they are heavier than their petrol and diesel siblings, they consequently feel slightly less stable cornering at speed. The GRS version’s sports suspension, 17in wheels and wide tyres resolve this, giving the car plenty of grip in the bends, but the handling is secure rather than exciting. 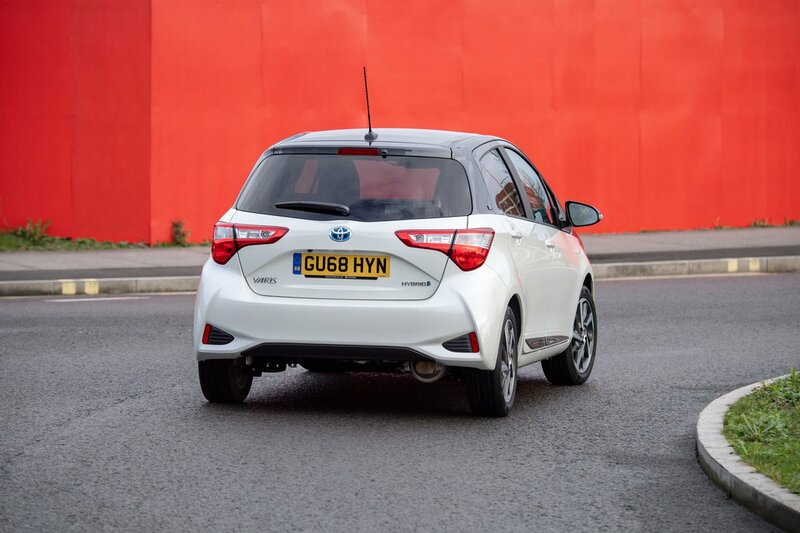 Even so, the Yaris is easy to drive and handle, with light controls and a tight turning circle that make it easy to drive and park in town, if not very engaging outside it. The hybrid model’s CVT automatic gearbox flares the revs of the 1.5 petrol engine when you accelerate, but it is always smooth. Those who drive mostly in town will also benefit from near-silent low-speed electric progress over short distances. Push either the 1.0 or 1.5 hard and the engine booms loudly in the cabin, with the 1.0 three-cylinder sending back more in the way of vibrations through the controls. Noticeable road and wind noise also frustrates on the motorway, whichever engine you choose.